To rinse, or not to rinse? A very Hamlet-esque question for us this fine Tuesday morning! If you are serving it as a cold salad and you need to get it cold. Fast. If you are cooking a gluten free pasta that is rice based or corn based. This needs to be rinsed with as cold of water as you can get from your kitchen sink. The best al-dente rice pasta needs to be rinsed of all the rice-y, starchy water. 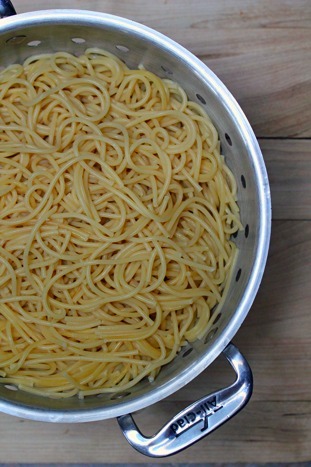 If you are planning to serve the pasta plain, as part of a “pasta bar,” or if you plan to store the noodles in the fridge (say for a child), then go ahead and rinse off the starchy-ness. If you are going to use the pasta in a baked dish, such as Italian Stuffed Shells or Baked Spinach Pasta. There you have it…the answers to the age-old question, to rinse or not to rinse!!?!! You have a great site. I like all you have to offer for moms. Today, I published a positive review of your site on my blog site, http://www.justaminutemom.com/?p=708. We are new to the blog world and want to build on-line relationships with great sites like yours! Very good advice. Now, can you tell me why my spaghetti noodles ALWAYS stick together? Am I cooking too long? Not long enough? You need to add a few drops of olive oil to the water, the olive oil keeps the pasta from sticking together. Amber needs to know about Rachael Rays advice…Add pasta to boiling hot water to avoid sticking together. If you add pasta to cold water it will stick. My experience has been the pasta sticks to the bottom of the pan. What a mess!!! I always cook my spaghetti in very well salted water until it is al dente. I never cook it longer than that. Then I drain it but leave the last 100 ml in the pan. I throw the pasta back into the pan and use a fork to stir it through the cooking water. I don’t know why this works but it does. Use enough salt, don’t worry about that becaus the majority stays in the water that your throw away. I have had the pasta sticking thing happen over and over, Since I have started string more often, using a larger pot to boil in and adding more oil (1/4 for a large pot) to the water I have pretty much eliminated the sticky stuck together not quiet cooked clump of noodle mess. The oil i have found is more for not letting the water boil over. But yes, you should use highly salted water, and the noodles don’t tend to soak in the salt as long as they don’t sit in the water after boiling. Drain immediatly.